Rodeowave Entertainment announced its launch today (5/2) with flagship act Phil Vassar. His first single for the full-service label is “Let’s Get Together,” which is already at radio and available for free download here. 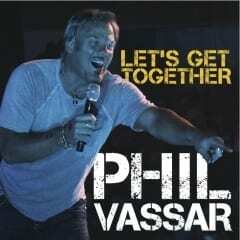 Vassar is set to release a full-length album this fall and he is currently headlining the Phil Vassar – Peace Love Music Tour 2011. On board with the company are Teddi Bonadies overseeing operations, Bill Macky spearheading radio promotion, and regionals Stan Marczewski (NE/MW) and Ken Rush (SW). Another addition to the team is expected to be announced soon. “I had the pleasure of working with Phil since the inception of his career,” says 25-year industry vet Bonadies, who worked with the piano man during his early days on Arista Nashville, and later at Universal Records South. “He is a consummate artist and a hit songwriter. His energy and drive are infectious and I’m looking forward to great things to come!” She can be reached at Teddi@rodeowave.com and 615-496-6352. With 30 years of music industry experience, Macky’s resume includes 16 years in radio, and later time as Executive VP of Promotion at MCA Records, Sony, Category 5 Records and 1720 Entertainment. He has charted 49 No.1 singles. Reach him at Bill@rodeowave.com or 615-202-8135. Rush is a 40-year veteran of the country music industry, including his first 20 years in Texas radio. For the last two decades, he has served as Director for the Southwest region for MCA, Arista and Equity Records. Rush was involved in the successful promotion of 69 No. 1 records. Reach him at Ken@rodeowave.com or 214-616-3047. Vassar’s career spans more than a decade of hit songs, including three No. 1’s (“Just Another Day In Paradise,” “In A Real Love,” and “Last Day of My Life”), and eight Top 10 hits from six albums. He is an award winning singer who has been honored by CMA, ACM, MusicRow and ASCAP. His songs have been recorded by other stars including Tim McGraw, Alan Jackson, Jo Dee Messina and Collin Raye.